Electricians in Whitstable, kent. Part P approved electricians in Whitstable. If you are looking for an electrician in Whitstable, then Jackson Electrical are the go to electrical contractors in and around the Whitstable area. We work throughout the Whitstable area, also covering Herne bay, Canterbury and most of the south east of Kent. Our electricians are regularly within the Whitstable area, so if you see one and have a query we are always happy to help. Its is very important that any contractor that you employ is fully qualified and certified with the appropriate accreditation boards. The same applies with electricians. ourselves on being qualified to the latest version, BS7671 2008 amendment 1, of the electrical regulations. We are a Part P approved contractor with ELECSA and a registered member of the Electrical Safety Council. All works undertaken within the home come under part p of the building regulations, because of this only registered contractors may undertake work within your home. WE are Part P approved electricians so any work undertaken will come with a part p certificate, DO NOT ACCECPT WORK BY NON APPROVED ELECTRICIANS. We can carry out fuse board changes in Whitstable and the surrounding areas. If your fuse board is out of date and not up to current regulations then it could be potentially dangerous and not have the correct means of safe disconnection when a fault occurs. Many houses still have “old style” re-wireable fuse boards and with all of the extra electrical items we use nowadays, they will not provide safe protection from a fault. The best solution is to upgrade the fuse board to a 17th edition RCD protected board. We provide electricians in Whitstable, for all types of rewires. From rewiring or altering an existing circuit to a complete rewire of your house. We can work with you from design to installation and advise on low energy products to help you save money. We offer free consultations and free no obligation quotes and believe we offer very competitive prices to that of our competitors. All of our work will come with a full set of test results and you Part P installation certificate. 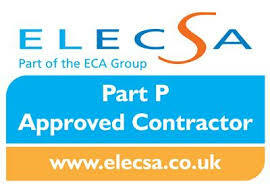 All of our work is guaranteed and an extended guarantee is available through ELECSA.